Limited Time Mail-in Rebate Offer! 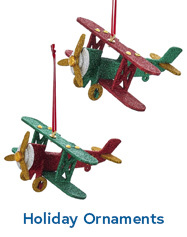 This item currently has a special mail-in rebate of $30.00 that is good through 4/30/2019! Click here to download the rebate form. This item currently has a special mail-in rebate of $30.00 that is good through Tuesday, April 30, 2019! Click here to download the rebate form. The Yaesu FTA-750L is a VHF Airband Transceiver packed with features, plus it includes a 66 channel GPS receiver for reliable navigation. Boasting an oversized full dot matrix LCD display, the FTA-750L Airband Transceiver provides full communication on the Aircraft communications Band ("COM" band: 118 ~ 136.975 MHz) and additionally provides VOR and ILS navigation features on the "NAV" band (108 ~ 117.975 MHz), and waypoint navigation with the built in GPS receiver. The Yaesu FTA-750L includes NOAA weather band monitoring and the capability of programming up to 200 memory channels with a quick and easy channel recall feature. 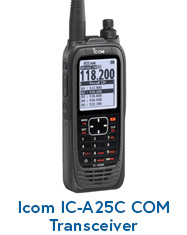 The brand new, easy to operate, menu system is icon driven making it simple to navigate through all of the powerful features this transceiver and GPS has to offer. Additionally the Yaesu FTA-750L can easily be reprogrammed in minutes using the optional PC Programming software and the supplied USB programming cable. 66 Channel WAAS GPS receiver! 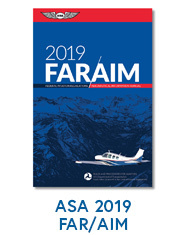 The FTA-750L features an integrated 66 Channel WAAS GPS receiver providing the capability of quickly storing current position information as well as manually entering in waypoints for reliable navigation. When a waypoint is activated the navigation screen features a compass display with Bearing, Course over ground, distance and speed information. GPS Position Logging operation! The FTA-750L includes a GPS Logging feature when activated automatically stores your position information at preset intervals. This is a great feature when backtracking is necessary. ILS (Localizer & Glide Slope) and VOR Navigation! When the FTA-750L receives a VOR signal the display will automatically switch to the Navigation band screen, with CDI (Course Deviation Indicator) based on the received VOR signal. Easy to operate! The FTA-750L comes configured with an easy to operate icon driven menu system. The displays and menu settings are logically configured for a more intuitive user interface. Great display! The FTA-750L features a huge 1.7" x 1.7" full dot matrix LCD display with full backlight and dimmer. The high resolution display makes it easier to view all the great features the FTA-750L has to offer. Well accessorized! 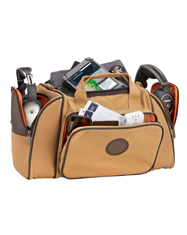 Includes rechargeable Lithium Ion (Li-Ion) Battery, AC wall charger, DC Cigarette Lighter Adapter, headset adapter cable, alkaline battery case, belt clip, and USB programming cable. Everything needed, right out of the box. 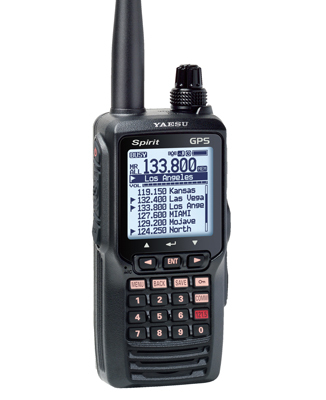 The Yaesu FTA-750L features a IPX5 waterproof design protects it against rain and water jets. 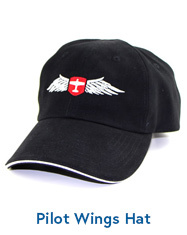 Great for flight line personnel, airshow use, and anyone using a transceiver outdoors where it may rain. In addition it's 800 mw audio amplifier makes the FTA-750L louder than any other handheld transceiver available today (for example, it's about 35% louder than the Icom IC-A23). The Yaesu FTA-750L is powered by a high capacity 1800 Mah Lithium Ion battery that will last over 12 hours between charges. 200 memory channels can be easily programmed into the FTA-750L allowing quick easy access to frequently used channels on the aviation band. Each "book memory" channel can be programmed into the unit using the included PC programming software and cable. All memory channels can be labeled with either a channel number assignment, operating frequency display, or an alpha-numeric channel name display. Breaking the squelch threshold has never been easier. Press the Squelch button for two seconds and the FTA-750L's squelch remains opened for monitoring weak and distant signals. Pressing Squelch again restores squelch settings. This is TRUE one handed operation. No need to fumble with tightly spaced concentric knobs! Receiver Battery Saver feature is designed to maximize the life of the transceiver's battery. When the FTA-750L is in the standby mode the battery saver de-energizes the transceivers circuitry, waking up at user selected intervals to sample for radio activity. If no activity is detected the FTA-750L goes back into its sleep mode. Current consumption is minimized, thereby maximizing battery life. 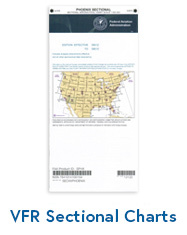 This feature is only found on Yaesu's air band transceivers! The FTA-750L can receive all 10 NOAA weather broadcast frequencies. The Automatic Active Weather Channel Locator automatically scans for active NOAA weather stations in your area when the Weather band is selected. TX 118.000 - 136.975 MHz (COM Band), RX 108.000 - 117.975 MHz (NAV Band), RX 118.000 - 136.975 MHz (COM Band), WX channels WX-01 - WX-10 8.33 Khz channel spacing. 5.0 W (PEP), 1.5 W (Carrier Power) @ 7.2 V DC 700mw audio amplifier. Difficult to program. Keys are small. Not an intuitive user interface. User must scroll continuously to locate features...not practical in a task-intensive environment like a cockpit. Review: Very good value for your money. It's my first hand held radio .I gave it only 4 star the instructions to program and use the radio is not clear and it take an effort to program correct. In general I am very pleased with it. It's a great performer, worth the money. It would be nice if it had a color screen. The printed manual that comes with it could be better if it had examples for using. It met 95% of my expectations. I would be happy to purchase a better a printed manual from YAESU. Looks Good but has some short comings!!! Pros: Good product, good display screen, easy to read. 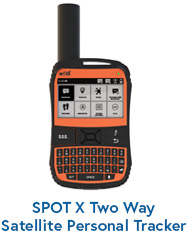 Review: This transceiver is a good product, I would buy products from this dot com again. Review: AS ADVERTISED, THE SYSTEM WORKS VERY WELL. THE YAESU NAV/COMM SYSTEM CAME WITH ALL SUPPLEMENTAL ACCESSORIES AND WAS PACKAGED WELL. INSTRUCTION MANUAL IS WRITTEN WELL. THE CHARGING CRADLE/STAND IS NOT WELL DESIGNED. IT FUNCTIONS AS A CHARGER AND IS FAST; HOWEVER, IT IS A LIGHT PLASTIC AND FLIMSY AND TAKES TWO HANDS TO SET THE RADIO INTO POSITION. 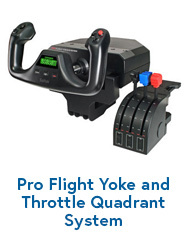 Excellent Back-Up Radio For Pilots! Review: I purchased this radio as a back up when flying and to listen in on air traffic radio calls while I am learning. easy to use, large well lit screen and the GPS Capability is a must in this day and age. Great value for the money. Cons: The programming manual needs help, it would be nice to group airports into groups and be it is there just need to figure how to do it. Cons: Not user friendly. Had to go online to online manual for use. Would be nice to have a factory printed user manual which I would be happy to buy. 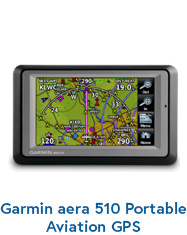 A: The FTA-750L does have an internal GPS receiver. It will show you the current latitude and longitude position, assist you in waypoint navigation, and includes a compass and data / cookie trail logging function, but it does not have a moving map display. 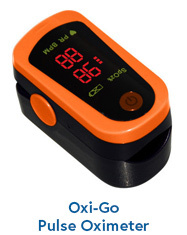 You can read more about the GPS functions on pages 58 to 65 of the FTA-750 User Guide. 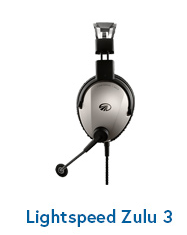 A: This comes with a standard fixed wing headset adapter. 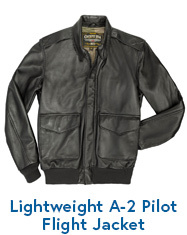 It accepts the dual PJ plugs found on most general aviation headsets. Fits the Yaesu FTA-750L, FTA-550, and FTA-450 series radios.